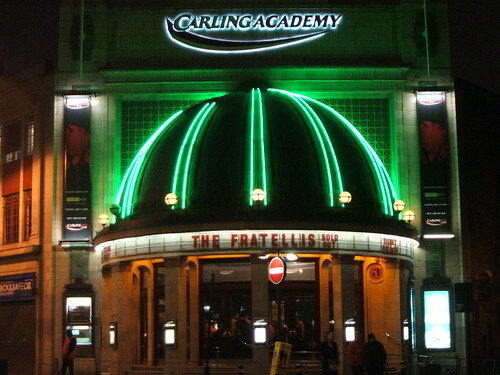 Brixton Academy was packed to the rafters with an extraordinarily good-natured crowd for the second night of the Fratellis’ four-date visit to the venue on Saturday night. With cider at £3.50 a can and lines six-deep at every bar, it can’t have been the drinks prices or service that made everyone so cheerful, so it must have been the music. And the Fratellis certainly didn’t disappoint in terms of the tunes, with crowd-pleasers like Flathead, Creeping, and of course Chelsea Dagger spread evenly throughout the set and plenty of energetic bouncing around the stage from mop-headed guitarist and singer Jon Fratelli. They gave everyone exactly what they wanted: loads of stomping good tunes to jump up and down to. For Cuntry Boys & City Girls and opener Henrietta, the band went upmarket with the addition of a three-piece horns section, but alas the horns got totally drowned out by the guitar riffs. In fact, the sound on the night seemed to be uniformly below average: granted, the Fratellis have strong accents, but the one time Jon Fratelli managed to interact with the audience between songs, his words were muffled to the point of incomprehensibility. The lack of sound quality and absence of interaction didn’t seem to matter to these Fratellis’ fans though: the crowd made its way out after an inspired cover of Goldfrapp's Ooh La La for the finale with a big collective smile on its face. An inspired choice by the post-gig DJ of Sweet Caroline and the ‘Da da da da’ of Chelsea Dagger could be heard reverberating around the Academy as everyone left, and followed many unfortunate tube travellers onto the Victoria line later that evening, letting them know what a great gig they’d missed.